The San Felipe de Barajas fortress seen at night. CARTAGENA, Colombia — It won’t be long before Cartagena on Colombia’s Caribbean coast will be 500 years old. It was a Spanish colonial city, founded in 1533, a fact brought to life in surviving architecture. The city boasts a charming UNESCO-protected Old Town with historic churches and houses, nearly seven miles of city walls and a fortress described as the largest in the Americas. 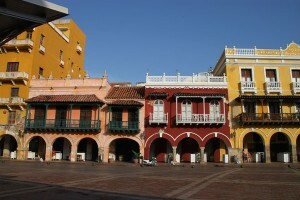 In addition, because of its location on the Caribbean, Cartagena is a sun ‘n’ fun destination and a cruise port. 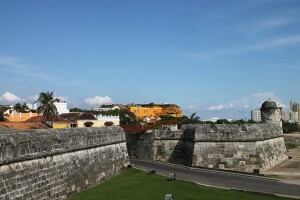 A section of Cartagena’s nearly seven miles of city walls. The orange exterior of the Santa Teresa Hotel is visible at center rising above the walls. The history, in combination with the climate and beaches associated with a resort, makes Cartagena one of Colombia’s most popular destinations for Americans. It also is one of several Colombian cities with a tourist police unit. I visited Cartagena for the first time in mid-2012 with a small group of travel writers. 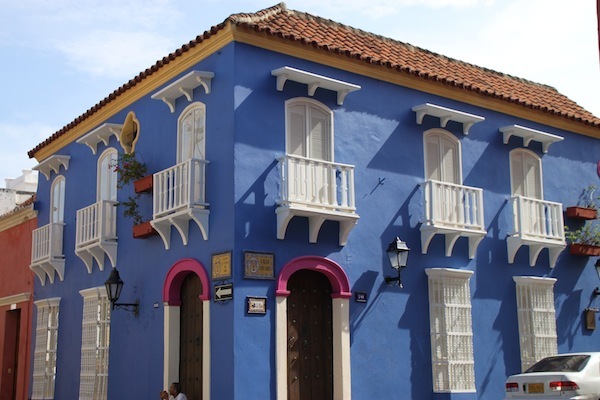 A rich pink for the trim offsets the blue of this house at the corner of the Plaza de San Diego in Cartagena’s Old Town. • For starters, the historic Old Town, mostly surrounded by colonial-era walls, is extensive, colorful and very appealing. I made several solo excursions, sometimes in the early morning, walking through picturesque squares to admire balconies, bright paint jobs and soaring church steeples. Side streets are narrow, our hosts said, because the houses provide shade for each other. I walked on the city walls, whose first sections were constructed in the late 16th century, for stunning views of the Old Town, as well as the city’s harbor and the high-rises of the nearby and recently developed New City. About 30 percent of Cartagena’s 1.2 million people live in the Old Town or the New City, our guide reported. 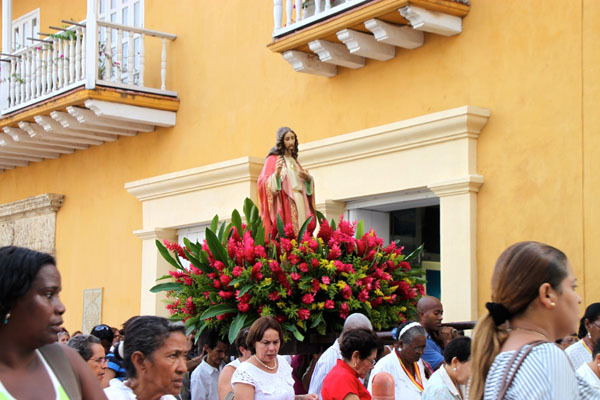 A religious procession in the streets of Cartagena’s Old Town. During one stroll, I stumbled onto a religious procession, as well. • We were guided through the city’s largest fortress, San Felipe de Barajas, on the rocky crag overlooking the city and so well fortified it was unconquerable. It is beautiful when lighted at night, but by day, the gray stone structure is not very pretty. Rather, it is dramatic in size and complexity, with great long slanting walls to a very green lawn below. Our guide advised the fortress covers 15,000 square meters, or about 3.7 acres. It originated in the 17th century to protect Cartagena from pirates and was enlarged in the 18th. Our visit included climbing to several levels and descending steep steps to look at hideouts for men, food and ammunition deep inside. 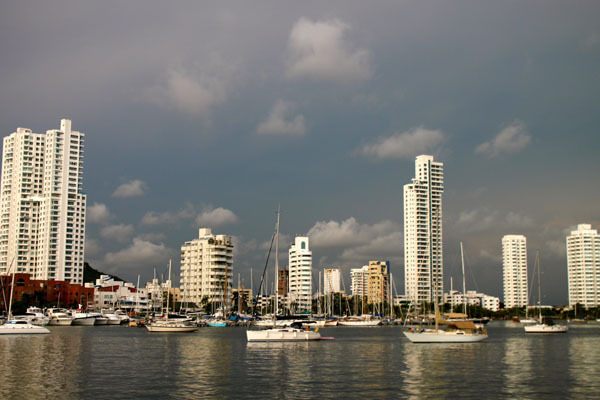 • We sailed in Cartagena’s harbor late one afternoon aboard a 64-foot catamaran. The Inner Harbor with a few of the high-rises that typify some of Cartagena’s modern neighborhoods. This was a slow and smooth ride, departing from a dock in front of the Old Town walls and heading into the harbor area that serves cruise ships. The sailing provided sightings of a lot of New City’s skyscrapers as we headed away from the Old Town. 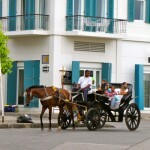 One of Cartagena’s horse-drawn carriages taking visitors on a sightseeing ride in the Old Town. 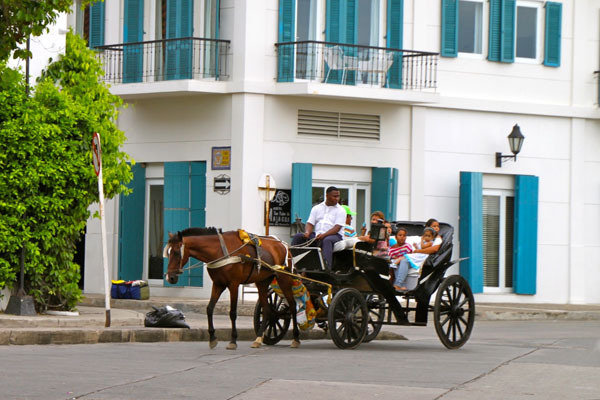 • Our group also sampled a very popular sightseeing mode — the horse-drawn carriage, which conveyed us up and down the narrow streets of the Old Town in the early evening. It’s another leisurely way to look at the city. Such tours aren’t available during the heat of the midday, to protect the horses. • Colombia produces 65% of the world’s gem quality emeralds, according to our host at the Joyería Caribe Emerald Museum and Factory in Cartagena. 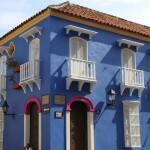 Gold and red are popular colors for houses in Cartagena’s Old Town. These are on Plaza de los Coches, once the site of the city’s slave market. the look of emeralds in the rough and exhibiting pre-Hispanic emerald and gold objects. We were advised that Cartagena is 900 miles from the emerald mines in the Andes but that Bolivar state, where Cartagena is located, produces seven tons of gold a year. Cartagena was the place to buy jewelry!